Join John Yorke in the Final Draft Marquee where he will be signing copies of his book Into The Woods. The idea of Into the Woods is not to supplant works by Aristotle, Lajos Egri, Robert McKee, David Mamet, or any other writers of guides for screenwriters and playwrights, but to pick up on their cues and take the reader on a historical, philosophical, scientific, and psychological journey to the heart of all storytelling. 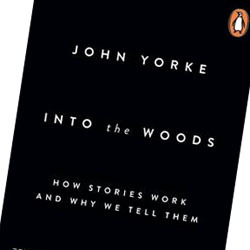 In this exciting and wholly original book, John Yorke not only shows that there is truly a unifying shape to narrative―one that echoes the great fairytale journey into the woods, and one, like any great art, that comes from deep within―he explains why, too. With examples ranging from The Godfather to True Detective, Mad Men to Macbeth, and fairy tales to Forbrydelsen (The Killing), Yorke utilizes Shakespearean five-act structure as a key to analyzing all storytelling in all narrative forms, from film and television to theatre and novel-writing―a big step from the usual three-act approach. Into the Woods: A Five-Act Journey Into Story is destined to sit alongside David Mamet’s Three Uses of the Knife, Robert McKee’s Story, Syd Field’s Screenplay, and Lajos Egri’s The Art of Dramatic Writing as one of the most original, useful, and inspiring books ever on dramatic writing. John Yorke is Managing Director of Angel Station where he works as a drama producer, consultant and lecturer on all forms of storytelling. Join Jonathan Lynn in the Knapp Gallery where he will be signing copies of his book Comedy Rules. Join Lucy V Hay in the Knapp Gallery where she will be signing copies of her books Writing and Selling Thriller Screenplays, Writing and Selling Drama Screenplays and Writing Diverse Characters.